Built on a historic quarry site within the 18th-century Bretton Estate, The Weston (named after significant supporter The Garfield Weston Foundation) will upgrade the visitor experience at the East Entrance to the Park, less than one mile away from M1 Junction 38. The new visitor centre comprises a restaurant (140m2), gallery space (125m2), public foyer (80m2) and shop (50m2). 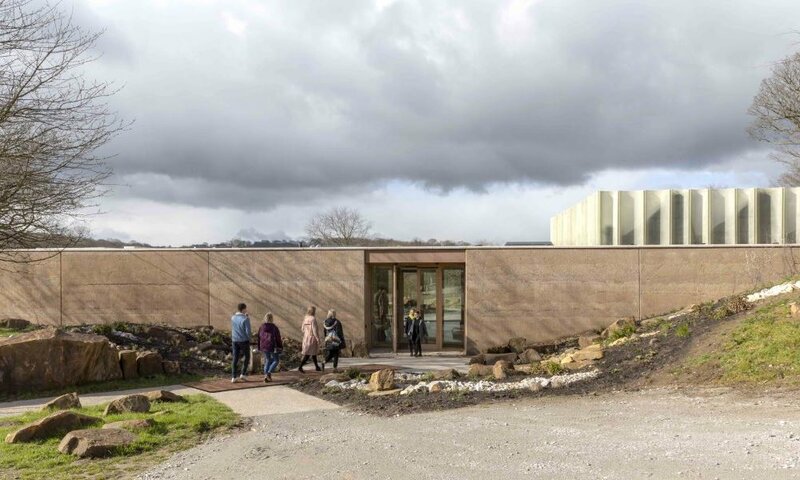 It is hoped the visitor centre will increase essential capacity at the open-air museum and gallery in Wakefield, West Yorkshire, which welcomed over 480,000 people in 2017, its 40th anniversary year. 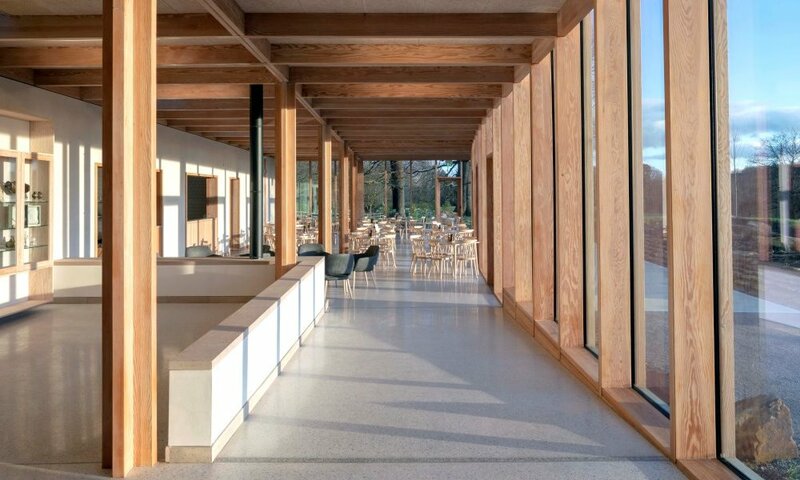 The light-filled building is designed by architects Feilden Fowles and constructed by Yorkshire-based company William Birch. The Weston is an important addition to the Park’s physical infrastructure, which began with the opening of Longside Gallery in 2001, This was followed by a number of buildings including the YSP Centre in 2002, the Underground Gallery in 2005, the transformation of the estate Kennel Block into a learning centre and café in 2011; the restoration of the Chapel in 2014; and the refurbishment of the Bothy Gallery in 2016. 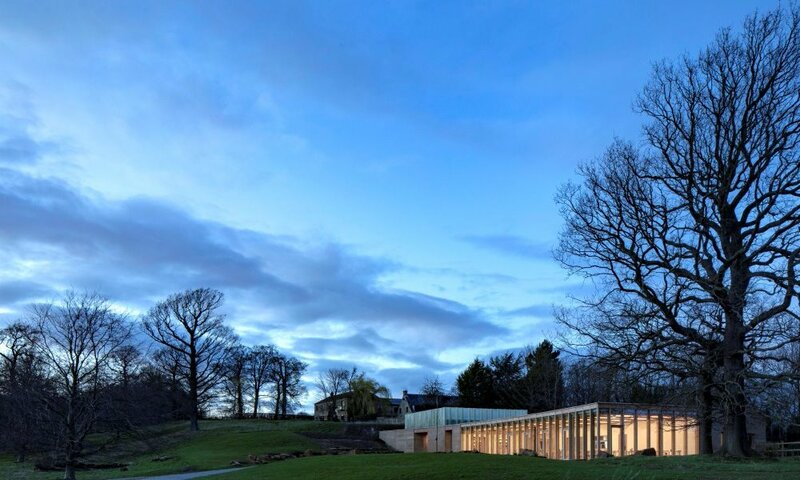 Named Art Fund Museum of the Year in 2014, YSP contributes around £10m each year to the local economy. The YSP is an independent charitable trust and a National Portfolio Organisation, receiving funding from the Arts Council and also from Wakefield City Council. However, it still has to raise 70 per cent of its income each year, which it does through car parking charges, retail, sponsorship and special events – making the new centre crucial to its growth and future resilience. Founded in 1977 by Executive Director Peter Murray CBE, YSP was the first sculpture park in the UK, and is the largest of its kind in Europe, which he says provides the only place in the world to see Barbara Hepworth’s The Family of Man in its entirety alongside a significant collection of sculpture, including bronzes by Henry Moore, and site-specific works by Andy Goldsworthy, David Nash and James Turrell. 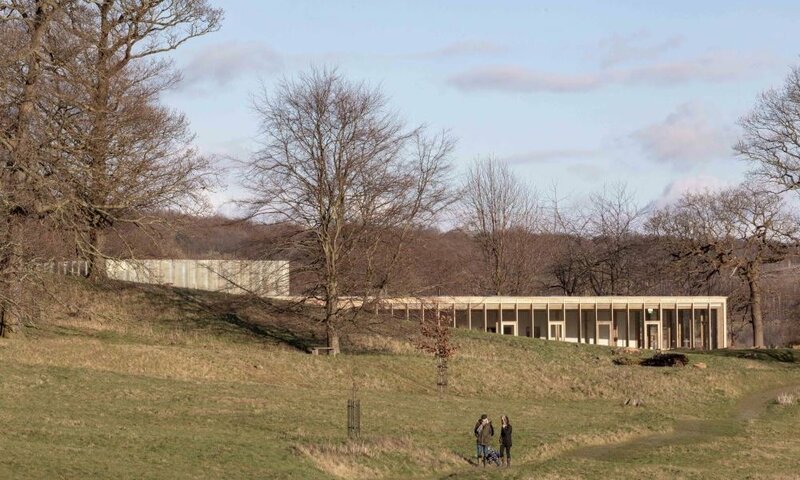 The YSP is now recognised as the leading international centre for modern and contemporary art. It mounts a year-round temporary exhibitions programme including some of the world’s leading artists across six indoor galleries (space totalling 1,465m2) and the open air. Recent highlights include exhibitions by Giuseppe Penone (currently showing), Chiharu Shiota, Alfredo Jaar, Tony Cragg, KAWS, Bill Viola, Anthony Caro, Fiona Banner, Ursula von Rydingsvard, Amar Kanwar, Yinka Shonibare MBE, and Jaume Plensa. 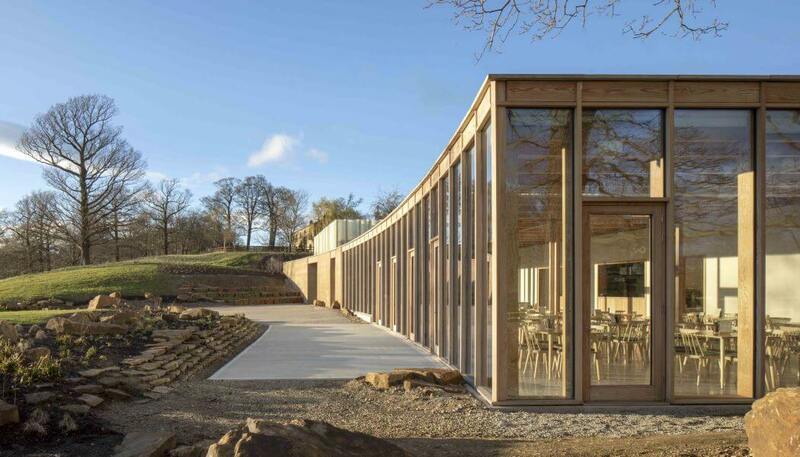 The new centre has a Scandinavian, light feel to it, says Murray and not only does it provide an extra dimension for visitors, it also improves the park’s sustainability by making it more financially viable through increased visitor spend. 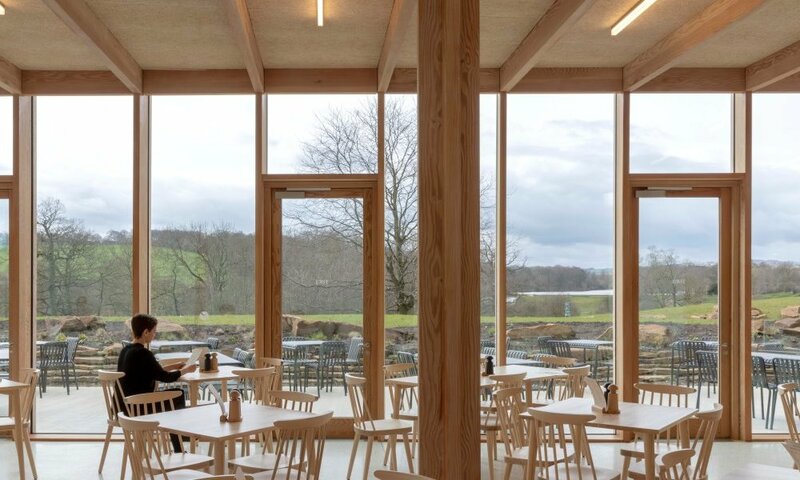 It extends the catering offer, which can get extremely congested, especially at weekends, and joins The Kitchen at YSP Centre, The Café at YSP Learning Centre and Coffee Longside Kiosk. The Weston Restaurant will be different to the other outlets as it will be table service, whereas the restaurant in the more established visitor centre is self-service. The shop at the Weston will be smaller than the one in the YSP Centre but will be more concentrated on commissioning jewellers and ceramic designers. The new centre also has a new car park and entrance and from inside the building visitors can experience ‘wonderful vistas’ taking in the mansion and lakes. The opening exhibition at the Weston Gallery has been created by two Indian artists Thukral and Tagra: Bread, Circuses & TBD – two young artists who have worked together for many years and are very much concerned with rural issues. Murray used to run a post graduate course in art education at Bretton Hall, which was established as a college in in 1949. He says it had quite a reputation as a college of the arts when he arrived in the 1970s and had the idea of putting sculpture in the landscape. In terms of acquiring the land, he says, that happened over a period of decades with some of the land being gifted to us from Wakefield Council and some of it purchased, including Longside, which was a result of a National Lottery Heritage Fund grant. 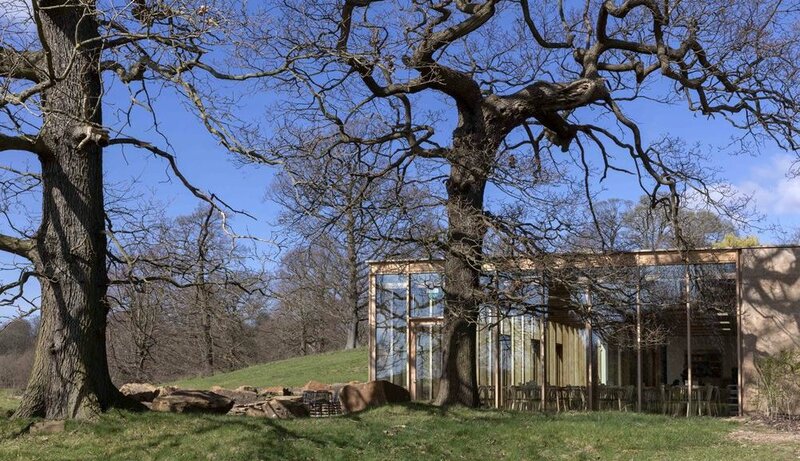 One of the YSP’s qualities is the ability to provide visitors with the opportunity to see an exhibition such as Giuseppe Penone’s current show where his work is on view both in an indoor gallery and also on a massive scale among the landscape all in one go. Murray says that there are very few places where that can happen and has meant that the YSP has had a great influence on other nearby cultural developments such as the Henry Moore Institute and the Hepworth Wakefield. The project is supported by Arts Council England, Wakefield Council, The Garfield Weston Foundation, Dunard Fund, The Foyle Foundation, The Sackler Trust, The Wolfson Foundation, B&M Retail Plc, The Arnold Burton Charitable Trust, The John S Cohen Foundation, Mtec, The Holbeck Charitable Trust, Catkin Pussywillow Charitable Trust, and other funders who wish to remain anonymous. Visitors to the Park have also contributed over £50,000 in donations to the project. YSP’s core work is made possible by investment from Arts Council England, Wakefield Council, Liz and Terry Bramall Foundation and Sakurako and William Fisher through the Sakana Foundation.